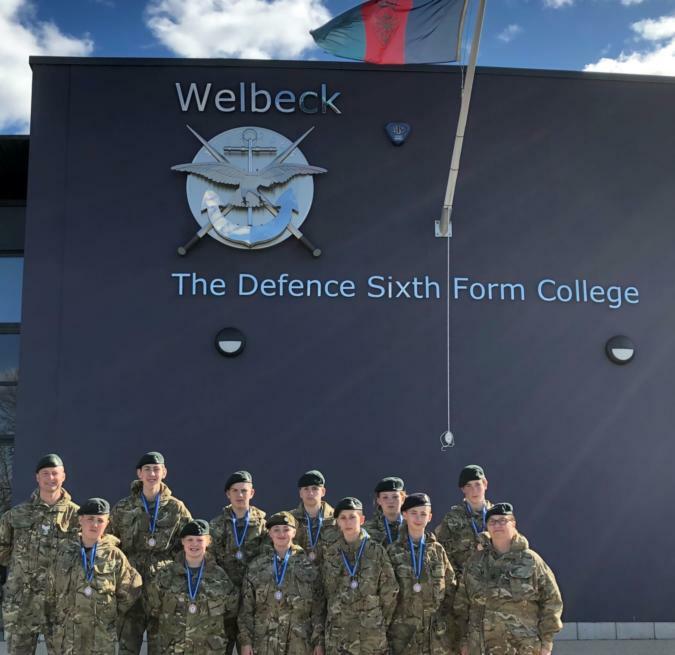 An elite team of ten cadets from B Company, headed up by Lance Corporal Harry Insley from Chelmsford, have recently returned from a challenging competition at the Defense Sixth Form College, Welbeck. The Essex team achieved an extremely impressive 3rd place and were, for the second year in a row, the top-placed ACF team. The aim of the weekend was to introduce cadets to challenging activities to test their leadership, teamwork and ability to think under pressure whilst in a competitive military environment. The team were lucky enough to be chosen to represent the county in this prestigious location and the weekend involved 17 challenging stands done as a round robin. Including events that ranged from an Indoor Clay range, Command tasks sponsored by regular Army units, Signals and radio challenge and a special event sponsored by the ‘Bloodhound’ world land speed record team. Royal Electrical and Mechanical Engineers (REME) tasked the cadets with recovering a stranded Land Rover from a ditch using winches and equipment used by this regular Army regiment. Another challenge involved making a bridge from rope to cross a river. A further task included the use of leavers to move heavy loads. 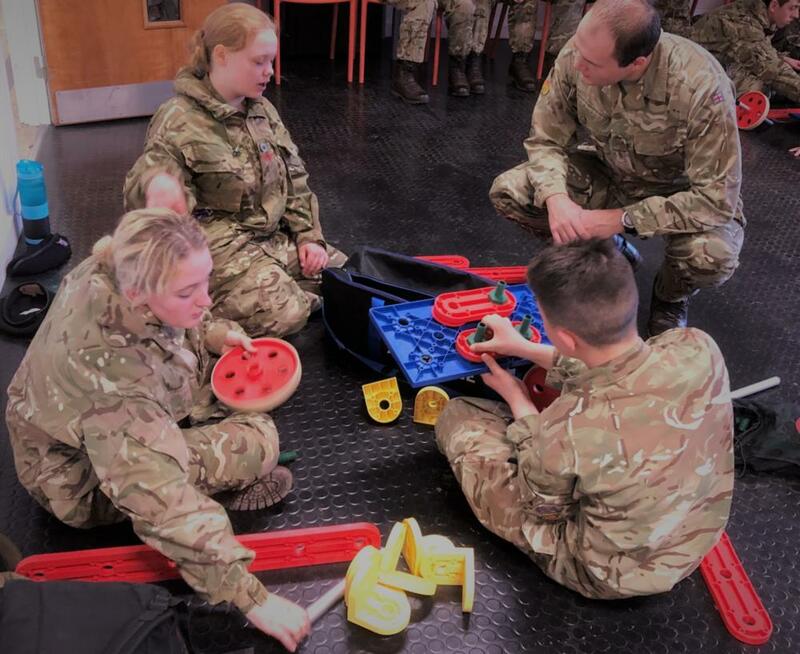 In each scenario the cadets were fascinated by the explanations given by the regular soldiers manning the stands who explained how the real life skills being practiced by the teams had been used operationally and how the infiltration of STEM skills is vital part of military life. The ‘Bloodhound’ team, who currently hold the land speed record, brought their vehicle the ‘BLOODHOUND SSC’ (Super Sonic Car) which is a unique, high-technology project the hope for the design is to build a car that will break the 1,000mph barrier and set a new world land speed record. Designed and constructed in the UK, BLOODHOUND SSC includes components and sponsorship from international companies and will make its next record attempt in South Africa. The team from ‘Bloodhound’ brought a unique insight to the cadets and showed some of the more unusual ways in which STEM has impacted on design, aerodynamics, and even the marketing angles of their special project. Welbeck College students created an extremely realistic first aid challenge.“A small explosion has occurred in Welbeck and the team had 10 minutes to divide into two separate teams and treat casualties. With injuries ranging for the effects of IED’s, arms trapped under a tank, burns and minor injuries. This event was made realistic due to the unique setting of the Defence Collage and the excellent props available. When the events ended and the scores were collated the Cadets of Essex had done themselves proud.